For recent versions of WordPress, upgrading has been as simple as logging into your Dashboard, seeing the notification of a new version available and clicking the automatic upgrade link. The process doesn’t always run smoothly and the most common error during the auto-upgrade is due to a timeout. Before you go running back to using the old way of backing up your files and database and performing a manual upgrade, this tutorial will guide you through some troubleshooting steps you can take to fix any timeout errors. Find the following directory: /wp-admin/includes/ 3. Using cPanel File Manger, edit the file named file.php. If you are using an FTP client, download and open the file. 4. Search for the line that looks like this $response = wp_remote_get($url, array(’timeout’ => 30)); 5. Change the default value of 30 to something larger maybe 180 (which is counted in seconds) $response = wp_remote_get($url, array(’timeout’ => 180)); Save the file and try again after that. It should fix the timeout issue. IMPORTANT: When you upgrade your WordPress install, you do overwrite the modifications you’ve just made resetting it to default – so this method needs to be repeated. 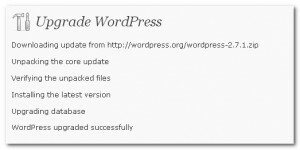 WordPress has a plugin called “Upgrade-Timeout” by Felix Ker which permanently fixes this problem, so you can also try that.